T-App is the workhorse temperature control application for use with any Quantum Northwest temperature controller/cuvette holder pair. Connect your computer to the temperature controller using a USB or RS-232 serial connection and run T-App for external control of the system. The primary purpose of T-App is monitoring temperatures. Connect a Series 400 or Series 500 thermistor probe to the external probe input of the temperature controller and use T-App to monitor sample temperature. Set the target (desired) temperature. For a multi-position sample holder, such as the Turret 4, Turret 6 or qCHANGER 6, T-App has additional menu items and controls to change to any position at any time. For many of our products, particularly those used for fluorescence measurements, the spectrometer manufacturer has seamlessly programmed control of the TC 1 into the program that operates the spectrophotometer. Where this has not been done, T-App may be used to accomplish coordination. 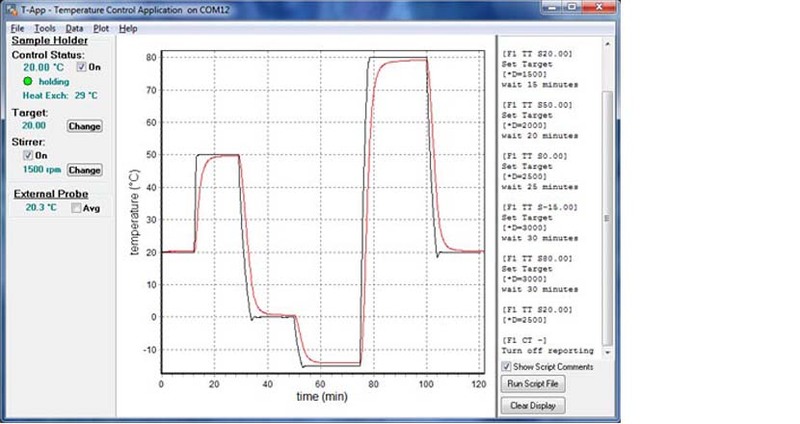 Generally, the control program that operates the spectrometer can be set to report data (e.g., single absorbance or fluorescence values) at a specified time interval and to save the resultant data to a file. By specifying the same reporting interval for both T-App and the spectrometer control program, and starting the two processes at the same time, the resulting data can be moved into Microsoft Excel to obtain absorbance or fluorescence as a function of temperature. T-App communicates with the temperature controller using simple text commands. A Script is a text file containing a group of these text commands to be executed sequentially by T-App. Generally, Scripts can be generated to automate, and accurately reproduce from day to day, the temperature control process, stirring and positioning.